The Best Introduction to Starfinder! I found this adventure was the best introduction there is to Starfinder. It's fun, exciting, and follows an engaging ongoing plot line. It's split into small quests so it can easily be played in short sessions, which is great for new (or young!) players. It has a lot of handy sidebars for GM use that are great for beginners still getting used to the system, and it has some cheat sheets compiled as player handouts to make it easier for beginner players, as well. A nice balance between starship combat and regular gameplay, and wonderful NPCs make this a must have. Plus, FREE? A special note to those of us who game with kids, both of my children (boy aged six and girl aged five) had a ton of fun playing Into the unknown. I have found Into the Unknown gives everyone a little taste of each section of Starfinder. This quest was a phenomenal intro into Starfinder. It displayed and helped explain many pivotal concepts to Starfinder (i.e. starship combat, the SF action system, the new DC system, etc..). Also, when played in order, it had a great, albeit segmented, storyline. Otherwise, it is a nice adventure, that can easily be broken down into two sessions (the first 3 parts, then the second 2). Good intro' to space combat. Need to favorite this one so I don't lose sight of it. So does this include the pregens, or do they come separately? Pregenerated characters for this adventure would be the seven iconic characters set to be released for use in Starfinder Society Roleplaying Guild as a whole. 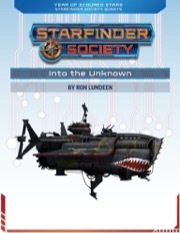 I anticipate the pregenerated characters will be a separate download on a Starfinder Society resources page, much as are the pregenerated characters for Pathfinder Society now. Why have the Quests been taken off the Available list with a release date of August 17th and made unavailable? I guess that means that they won´t be available before august 17th? Is there an ETA for the downloadable iconic Starfinder pregenerated characters? The pregenerated characters are in the later stages of production, so they should be showing up soon. As for having these quests available earlier, the public release date is the date at which they're released to the public. Our digital-only products do not have an early PDF granted in the same way that physical subscription products do, and the only people who get early access to these adventures are the volunteer GMs who are preparing to run them at Gen Con. For all other intents and purposes, August 17th is the release date, so plan your events accordingly. Thank you for confirming that this will in fact be available on the 17th. Can you tell me what the cost for this PDF is? Normally Quests are free, although not sure if a pack of them would be charged for. Personally I'd hope they would be free - This sounds like it would work well as a 'introducing people to Starfinder' product. Incredible! You guys and gals are the greatest! SWEET! !, can't wait to run this for some of the 40+ players in my SF Roll20 group!! The Starfinder pregenerated characters can be located here. You're giving away my hand-crafted, expertly-written quests for...FREE? Maybe we have to wait for a different today? Yes, it is tagged as replayable. Into the Unknown can be replayed for credit, but the credit must be applied to a different 1st-level character each time. When a GM runs a quest, she also gets credit applied to a character. However, each time she runs one, she can check off any one of the quest boxes on her Chronicle sheet. In this way, a GM can continue to earn credit toward a character even if she runs the same quest several times for different groups. What "quest boxes" is it talking about? There don't appear to be any boxes on the chronicle sheet for each quest completed, just for clues found. Is the idea that whenever you run a quest from this you can treat it as if your character that's getting GM credit has completed an arbitrary one of the quests (so you can always make progress to having done all of them, even if you ended up rerunning the same one for multiple different groups)? Usually on the chronicle sheet each quest has a check box preceding it for the GM To check to show the character has played through that one. It's entirely possible the boxes went missing (I haven't downloaded it yet), but the idea is the same. In an effort to not penalize GMs at conventions (or the like) who run the same one over and over, every quest run counts as a quest of their choice for their GM chronicle. Option B. They apply the credits/XP/Fame/Reputation of the highest amount completed. The listed amounts at lower quest completed levels are what they get if they choose to apply another chronicle sheet to the character before finishing them all (which prevents them from ever going back and playing more of the quests with the same character). In area C should the party be heading north or south? I'm pretty sure it's meant to be north but my map doesn't have C1,2 or 3 marked anywhere. Do you have to play pregens in these? Or can you bring your own character? I keep hearing about scenarios being tagged as this or that, but _where_ are these tags displayed? How are the crew numbers for the two NPC starships calculated? They seem a bit high for the intended player levels. Starfinder NPCs aren't built by the same rules as PCs. The front page, under the table of contents. I don't know if there's a way to find the tags if you don't own the scenario. Could be something they put into the product descriptions (if there was a way to see which scenarios had which tag in a big list or searchable way that would be great), or people who have the scenario could add it to the related pages wiki. I know. I meant that they seem too high for the intended challenge level; a recipe for a TPK. I know this is picky, but, I have been playing with creating a Mystic character, and saw this with the pregens. Aha, thanks! And yes, showing tags somewhere in the description here or in a combined document would be nice. The PCs have a much faster and more maneuverable ship. It makes a HUGE difference. Even the team I mistakenly did double damage to with the big gun on round 1 Was able to defeat the enemy through piloting properly. Expecting to run this a couple times I entered all the ships on the Starship Control sheet with extra GM notes. Can someone tell me where I got the math wrong for the first enemy ship? When I calculated the AC and TL out it came to AC: 10 TL: 10. +1 for Piloting but -1 for Large Size. But the scenario shows AC:11 and TL: 11. No armor or defensive systems listed. The pilot has 2 ranks in Piloting (+2), and the ship is Large size (-1), so an AC & TL of 11 is correct. Then shouldn't the Loreseeker's AC & TL be 12 not 13? They didn't want to pre-figure it, because, while unlikely, it is possible that the party may be forced to use the Piloting skill untrained. Will they fix the ship map to show where is C1, C2 and C3?